Imagine feeling restored, vivacious, and energized – at a soul level. Ah, the work! You are deeply committed to your growth and enlightenment. You've stared down specters of self-doubt and scarcity and reaffirmed your innate worth and abundance. You've set the tough boundaries, and there's a good chance you've said "no" more times in the last ten months than you have in the last ten years. You're following through on your mentor's recommendations and being accountable. Loving and generous, you give freely of your expertise and commit time to the causes that matter to you. You've put your heart and soul into building a business you believe in, and your mounting success inspires you to continue giving your clients the best you have to offer. In short, you're a badass. I've got a message for you: it's okay for your life to be going beautifully and still feel depleted. Feeling depleted doesn't mean you are ungrateful for all the beauty happening in your life. Feeling worn out doesn't mean you've failed, that you're not "cut out for this," or that you can't regain your glow. Feeling tired doesn't have to color your lifestyle, your parenting, and your friendships in a heavy cloud. It's time to energetically integrate all of the amazing work you've done so far. You've invested in the life coach, but want to really internalize your empowered progress. You're taking care of yourself nutritionally and physically, but want to feel more embodied. You've scheduled weekly time to relax, but want to feel deeply recharged. It's time for energetic rejuvenation. 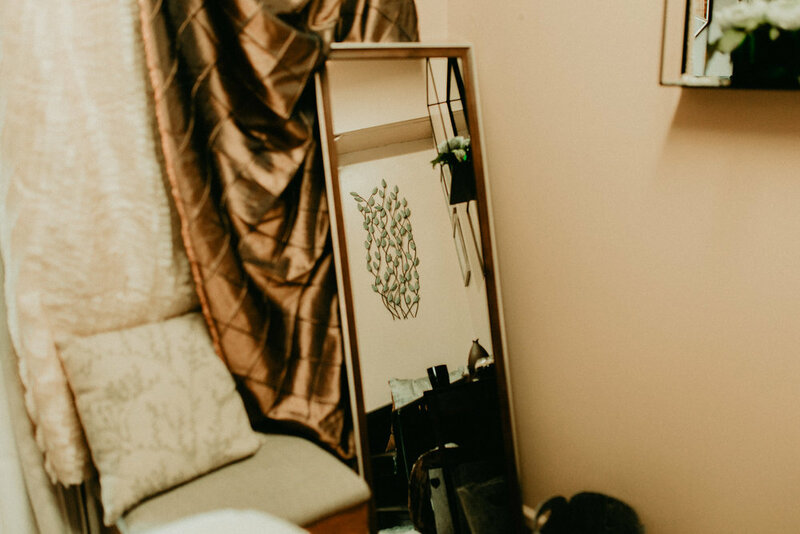 Your session is lovingly structured to provide an experience that feels beautiful and unhurried from beginning to end, including time to debrief and relax. You'll be welcomed into the light and airy studio. Tall white ceilings and shimmery bronze panelling invite time to stand still. I will give you a little orientation of the Reiki room. You'll lie down, face up, on luxe faux-sheepskin. Coppery fairy lights twinkle as you close your eyes. You'll be offered an eye pillow and led in a grounding meditation. You will be gently awakened from your session. You'll enjoy your tea of choice and relax technology-free while I paint an intuited Artwork for 30 minutes. Please bring a book! Fully refreshed, you'll be invited to share your experience, questions, or discoveries. This sharing is heard in full confidence and witnessed with empathic presence! You'll take home a sealed, hand-written brief of Light Notes highlighting what I intuit is intended for you to receive. This information may be catalyzing, comforting, affirming, or express in other ways. I will create a free-flowing, intuited artwork on canvas as a visual reminder and energetic continuation of your Reiki healing experience. This canvas will be energetically charged with Reiki healing in brief ceremony as a beautiful, light-filled expression of healing for your home or office. Your artwork will be packaged for convenient travel in a fully enclosed box! Reiki Energy Healing is the giving of light-filled, Universal life force energy through the hands of an attuned practitioner. I have been attuned as part of the Japanese Usui Reiki lineage by Reiki Master Mackenzie Rae. This energy has an intelligence that works independently of the practitioner holding space for the work to take place. The healing received always works for the client's highest good. The experience and skill of the practitioner and receptivity of the client may impact the overall experience of a Reiki session and how long the effects are felt. The work is given by placing hands on or above the body of the fully-clothed recipient. Reiki works to heal the Physical, Emotional, and Energetic bodies in profound ways while also facilitating spiritual and creative insights. The Jade Room has been designed as a sacred container of serenity that exists outside of time. The most recent addition is a beautiful Seahorse figurine. Seahorse as a spirit guide embodies patience and persistence, helping us navigate challenges by slowing down and taking a broader perspective. Seahorse always brings peace and expresses the Divine Masculine as provider and protector. He seemed like the perfect healing guide to work with us here! Payment is required at time of booking. Please wear comfortable, non-restrictive clothing for your session. Long-sleeved shirts and long pants are preferred but not necessary. Thank you! Reiki sessions are held at the Jade Consulting studio, located in the historic Carnation Building. 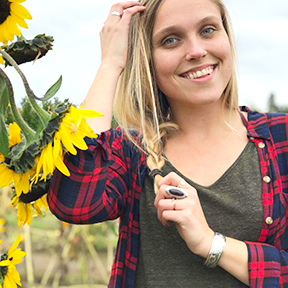 "Vegan Kait is a thriving online community dedicated to guiding you to achieving vibrant health, accomplishing your goals, and feeling amazing in your body! I'll cheer you along this plant-based journey every step of the way, because I believe that you have the power to change your life. Join me on Instagram for daily inspiration on Instagram at @kaitvisser!" "I have always been curious but highly skeptic of Reiki. I thought that every Reiki session used crystals, which technically goes against my religion. I decided to take Brooke up on her amazing offer of a Reiki session to see what it was like. I was so happy I went. She was so kind and sweet and made me feel so welcome and calm. She settled in with me in her cute little studio for Jade and talked to me more about the modality and her intentions and told me how it would go. I entered her super cute (and fairy-like) Jade room and laid down on the table with a cozy blanket. I honestly had no idea what to expect but was open to any kind of meditative experience I might have. She guided me through a short calming meditation then through the actual session of sensing my energy and I guess, working through it. It felt as if she moved and had her hands over the areas of my body that needed the healing. I don't know how to explain it, but it was like a light shimmering-chilling-and lifting feeling in the areas of my body she radiated light too. It felt, like light. I don't know how to explain it better, but I felt it for sure. I felt as she moved throughout my body that it was the same as moving through the obstacles in my life and my heart became heavy, and as she continued the work, for about an hour, my heart felt lighter and lighter (like we moved through obstacles). And finally, I felt a feeling of joy and peace and calmness come over me. She woke me from a sleepy state and brought me a cup of tea, and I got to sit in her little room for a moment to reflect and wake up. She provided me with a handwritten letter with a review of what she felt needed attention, like that my throat chakra was blocked. Which was creepily accurate to me. The biggest shift was how I felt afterward. I felt light and fully free and like my true and full self for most of that day. I HIGHLY recommend seeing her and experiencing this, especially if you are moving through any tough emotions, new phases in your life and are progressing positively on your spiritual life path."